Mrs. Jane Sinclair Quarterman Comer, b. 29 October 1905 d. 16 July 2005. Daughter of David Sinclair Quarterman Sr. and Alla Irene Peek of Valdosta. Married Walter Graves Comer of Americus, Ga.
Jane was a strong-willed character. She had a hard life in some ways, but was very optimistic and helpful to others. Nothing really got her down. She wasn't going to let anybody else tell her how to do things, if she thought she knew the right way. She lived alone in her own house until she was 95. At 99 years and 8 months she was the oldest relative any of us ever knew, and according to the family history she and her mother started, the oldest there ever was. She was frugal and forward-thinking. She said she was involved in starting Georgia Teacher Retirement, and she lived to benefit from it; she had been retired longer than most people's careers. She visited the site of the future Presbyterian Home in Quitman, and she went there in the end, as she had planned. Mrs. Comer was a graduate of Valdosta High School and Valdosta State College, and she had a BS in Education Supervision Elementary Schools from Georgia Southern College and an MS in Education Elementary Principal from the University of Georgia; she also studied at Duke University and Columbia University. Many people in Moultrie were Mrs. Comer's students, from first and seventh grades through her long years as principal of Winona Cox Elementary School. She was always concerned with the academic curriculum and beyond. For example, she borrowed a kiln, where she and her students and relatives fired plates and other dishes. Before Moultrie she taught in Lowndes County, and an especially memorable year at St. George, Charlton County, Ga., in the Okefenokee Swamp, where she tried to bring not just book learning but also art and a Christmas tree, which she said was the first they'd seen. During World War II, Mrs. Comer was Executive Secretary of the American Red Cross of Moultrie. As a child in Sunday School at the First Presbyterian Church of Valdosta on Lee Street Jane learned to sing Jesus Loves Me in Japanese as part of a mission presentation. In her later years she would tell that story and then break out singing in Japanese. In the 1930s Jane attended Midway Gathering. She helped with summer Bible School in the North Carolina mountains with some of her Walker cousins. When she joined the Moultrie Presbyterian Church she wanted to know all about its history, and was for a time church historian. Jane Sinclair Quarterman married Walter Graves Comer, September 1, 1940. He died less than two years later, and their only child, a daughter, was stillborn. Her cousin Marsha Q. McLean and Marsha's parents helped Jane through this difficult time. Jane said her wedding band used to have a series of flowers etched into it, but she had worn it smooth. Graves' sister Ruth Comer and Jane called each other at 9 o'clock every night for many years. Ruth and Duncan Sinclair's son Duncan Comer Sinclair and his wife Jan and family have been invaluable. Mrs. Comer introduced one of her teaching and Red Cross co-workers, Laura Elizabeth Hargreaves, to her brother, David Sinclair Quarterman, Jr. He would land his airplane on the field behind Jane's house to pick up his new fiancée. They met in February and were married in June; they had three sons. Jane loved her family history. She was always telling stories about family she knew personally and detailing her latest lines of inquiry going back hundreds of years, continuing research her mother started in 1918. She was a 70+ year DAR member and she kept up active membership in many family organizations, because she followed all lines back; for example, she was an honorary life member of Clan Sinclair. She got the newsletters; she visited the ancestral sites; she corresponded and visited. 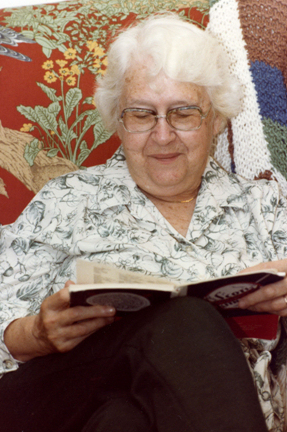 She was a supporter of the Odom Genealogical Library and of the Moultrie Scottish Gathering. One volume of the genealogy she organized has been published, with the help of her brother, sister, and nephews: Quarterman Family of Liberty County, Georgia, and Relatives. Much more by and about Jane is in that book. She loved to travel, hike, and camp. In 1937 she supplied the car for a trip her brother organized with their sister Elsie, their cousin Helen Quarterman, and friend Mary Small across the country to see the new Golden Gate Bridge. She would take the train from Valdosta to Quitman to visit her Aunt Janie Sinclair Jelks. Pictures show her on a camel in front of the pyramids in Egypt, at ancestral castles in Scotland, and at Oxford in England. Jane loved to drive to the mountains to dig and grind garnets with family and friends, or to the beach to collect sand dollars and visit ancestral cemeteries. She'd talk for half an hour and then say we must stop to see this cousin or that friend or that genealogical correspondent. Boxes of manuscript book would come out of the trunk of the car and into a courthouse, or into the house of an old lady with an overgrown yard, or the hilltop view house of the retired engineer who built Lake Sinclair. Papers and promises of information would be exchanged, and we'd go and stop more times for the rest of the day. She kept in touch with far-flung branches of the family, from Texas to South Carolina to Scotland, through frequent correspondence. She was devoted to children; especially her three nephews. She picked pictures of Midway Church ("Georgia's Cradle of Liberty") and of a guardian angel for her nephews' bedroom. She got a deal on photographs in Moultrie one year in the mid-1960s, so she went to her brother's farm and got the nephews for a picture that hung at the farm from then on. Many times in recent years she said her grand-niece and grand-nephew are the future of the family. The nephews and their children grew up stomping around cemeteries with Jane, recording epitaphs, placing military service markers, or just visiting as Jane talked about the people buried there. Jane went to Athens every summer for a couple of weeks to see her nephew and grand-niece, usually before or after the Highland Games. There she always watched the news and had some tidbit about what was going on; she was never lacking for an opinion. She kept a page of things to check off before going to the Highland Games at Grandfather Mountain. Sometimes it had to be rewritten when it got too ratty, although often the old one seemed to pop up next year. Elsie always brought the ham and silverware. The Athens crew brought the tents and other things. Going up to Grandfather there were stories to mark each spot along the way, about hiking back in to the swamp to see her students, about hiking up a mountain. clan notable who was particularly voluble about family connections to nobility, she remarked that most of our ancestors who emigrated from Europe were farmers, merchants, teachers, preachers, and such, and it was they who built this country. She was a fixture at the games for many years, walking around with her tartan scarves. Everybody still asks about her. No visit to Aunt Jane's very dark and green and quiet house in Moultrie was complete without a tour of the yard to see the blue tailed skinks and chameleons. She always kept her yard immaculate with the shrubs and bordered garden approach; in later years Curtis Rodgers helped. There was a little creek in the back with a bridge across it that children feared to cross. In her yard is a gardenia bush from where she first taught in the Okefenokee, along with camelias, oak leaf hydrangeas, tea olive, hollyhocks, altheas, pinkneya, azaleas, and climbing roses. The orange cluster montbrecia bulbs are from her grandfather's place at the Ridge near Darien. The ginger lilies in front are from her great-grandfather's yard near Midway. Inside, the living room and bedroom furniture was antique; at least one bedroom set was from her parents. The pictures of her Sinclair relatives on the wall went back more than a hundred years. The dining room table was covered with carefully ordered heaps of papers for each family she was researching, plus a filing cabinet of sources. She typed her manuscripts and correspondence on a manual typewriter. Her sitting room had travel guides and her major reference books laid out ready at hand, and another cloth with tartans, this one plus clan badges. Her dog, Fuzzy, a grumpy Cocker Spaniel, lived to be perhaps 18 years old. For decades Jane had everyone put stickers on things in her house saying what they wanted. "One day we'll have to go through that big trunk with the petticoats to find what might be useful." She was very organized and prepared for the inevitable; maybe because she was faced with it earlier and more directly than most. Jane gave all her relatives the crabapple jelly she made and canned, or peach with lemon, or ginger pear. Her own breakfast was always plain toast (sometimes with jelly) and instant Folger's black coffee; sometimes cantaloupe. She would offer a tomato sandwich with mayonaisse; sometimes with cheese. She and her neighbor Doris Childs would have parties in the back yard where Jane would serve the tomatoes she grew, sliced with salt. had to have oysters, asparagrus, ham, sweet potatos, and little sweet pickles, in their own pickle dish. Later there were tea and tea cakes on the rolling cart in the living room, with the winding clock, the peeling wallpaper, and the bookshelf with glass shelf covers. Jane always used to talk about the paintings in the house that she and Mary Small had done. There was always the question of when to start handing out presents. The aunties always got presents both in the old house and in her brother's house the next day. 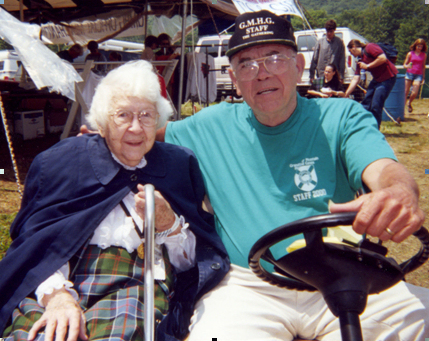 In 2000 the Grandfather Mountain Highland Games gave Jane and her sister Elsie each an award for being the oldest campers. Jane started going in 1968 and went every year from 1979 through 2000. While preparing to go to the games in 2001 on June 30, Jane had a mild stroke at home; Curtis Rodgers found her. She was hospitalized for a short time and was unable to return to her home and went to the Presbyterian Home in Quitman, as she had long planned. She died there peacefully in her sleep, with family present. Visitation will be at Harrell-Faircloth Funeral Home in Moultrie 5-7 p.m. 19 July, followed by a graveside service at 10 a.m. 20 July at Sunset Hill Cemetery in Valdosta, where we will bury Jane Q. Comer, wife of Walter Graves Comer, beside her brother, sister-in-law, parents, and grandparents. Readings will include "Crossing the Bar" by Alfred Lord Tennyson. Hymns will include Jesus Loves Me, God Be With You (Till We Meet Again), and Abide With Me. She is preceded in death by her parents, her husband, her daughter, and her brother. Tennessee; step-grandnieces and step-grandnephews: Lindsey and Mallory Phillips and James, John, and Adam Linton; and cousins Clark and Muriel Quarterman. In lieu of flowers, please contribute to the Red Cross, or a charity of your choice. Supervising teacher Georgia Southwestern College, Americus, Ga. Member -- Delta Kappa Gamma in Moultrie, Delta Kappa Pi, Uni. Ga.